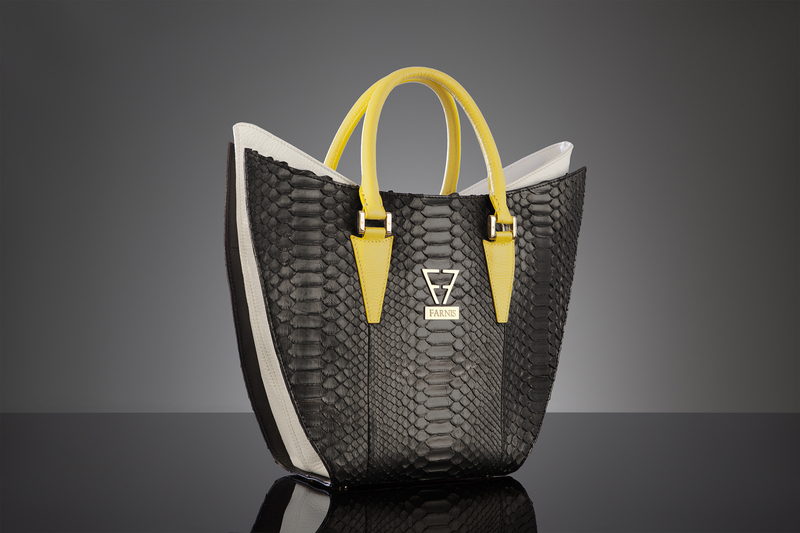 The QUEEN model is an exclusive handbag thanks to its design and craftsmanship. It is brimming with details and is a faithful testament to the FARNIS spirit. This exclusive model represents a new take on the classic pairing of black and white with its two vibrant-yellow handles. Metallic Pieces: 24k Gold-Plated brass hardware. QUEEN is a large handbag with a semi-rigid structure. It also boasts a removable smaller bag and a removable shoulder strap with hand-painted edging to wear it on your shoulder more comfortably.The main fastening system is a high-quality zipper and its characteristic handles have been hand sewn using artisanal craftsmanship. The exclusive FARNIS logo and the ensemble of small refinements secured by 24k gold-plated brass hardware, are the finishing touch featured on every handbag.